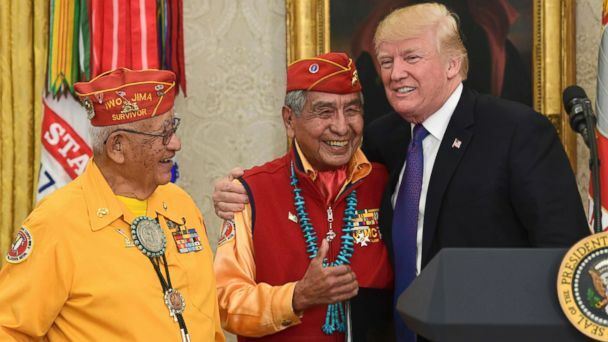 During an Oval Office event honoring Native American code talkers for their service during World War II Monday, President Donald Trump made a quip about Sen. Elizabeth Warren, terming her "Pocahontas" in an aside that received swift backlash shortly afterward. "We have a representative in Congress who has been here for a long time ... longer than you. They call her Pocahontas!" Trump said, referring to the Native American woman who married an English settler in Virginia in the early 1600s. Though Trump did not name Warren, D-Mass., Monday, he has previously used the nickname Pocahontas in reference to her. During her first run for U.S. Senate in 2012, the Boston Herald reported that Warren registered as a minority in law school directories in the 1980s. Warren defended herself by claiming she was told of her Native American ancestry by family members and that the registry was made in order to meet persons with similar backgrounds, rather than to advance her career. In an interview with MSNBC shortly after Trump made the remark Monday, Warren said that it was "deeply unfortunate that the president of the United States cannot even make it through a ceremony honoring these heroes without having to throw out a racial slur." At the White House, the president's remark was met with a brief silence before he continued speaking. White House press secretary Sarah Sanders later said she would find it "inappropriate" to use a racial slur, but that Trump's comment did not constitute one and that such a claim by Warren was "a ridiculous response." "I think that Sen. Warren was very offensive when she lied about something specifically to advance her career," said Sanders. "I don't understand why no one is asking about that question and why that isn't constantly covered." The Alliance of Colonial Era Tribes, an association of American Indian nations, disputed Sanders' stance in a statement Monday afternoon, noting earlier denunciations by Native Americans when the president previously invoked the name Pocahontas in a way that denigrates others. "The name becomes a derogatory racial reference when used as an insult," reads part of the statement from Dr. J.R. Norwood, the ACET's general secretary. "American Indian names, whether they be historic or contemporary, are not meant to be used as insults. To do so is to reduce them to racial slurs." The statement further claims that debated claims of Native American ancestry are fairly common and that, "when not used to claim the legal protections or benefits of the citizens of American Indian Nations, cause little or no harm to tribal people." The president of the Navajo Nation, Russell Begaye, said in an additional statement that "in this day and age, all tribal nations still battle insensitive references to our people." "The prejudice that Native American people face is an unfortunate historical legacy," his statement continued, but adding "the Navajo Nation does not want to engage in this dialogue between Sen. Warren and President Trump." Fellow Massachusetts Sen. Ed Markey defended Warren via Twitter Monday afternoon, agreeing that what was said in the Oval Office was a "slur." "It disparages the Native American war heroes, standing right beside the president, who risked their lives to protect his right to make such a disgusting comment," Markey wrote on Twitter.